It’s no secret that public libraries across America are under increasing pressure to provide a wide array of services beyond traditional book-lending. To that end, libraries are becoming hubs for public access to cutting-edge technology. At first, it was about simply having computers available for word processing and internet access. But over time, library users have sought a greater variety of resources, and that same trend has been true at The Colony Public Library. In 2015, several new or upgraded services have been added to TCPL. Following a successful community fund-raising challenge in the spring in which the Friends of The Colony Public Library partnered with real estate developer Jackson-Shaw, more than $10,000 were raised to purchase new Early Literacy Workstations. 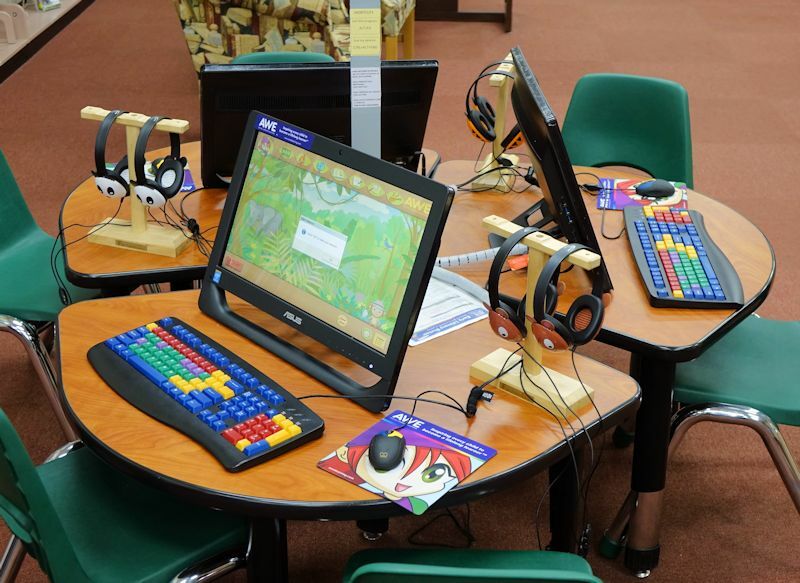 Thanks to a successful fundraising campaign and matching donation from Jackson-Shaw, The Colony Public Library recent purchased new Early Literacy Workstations. 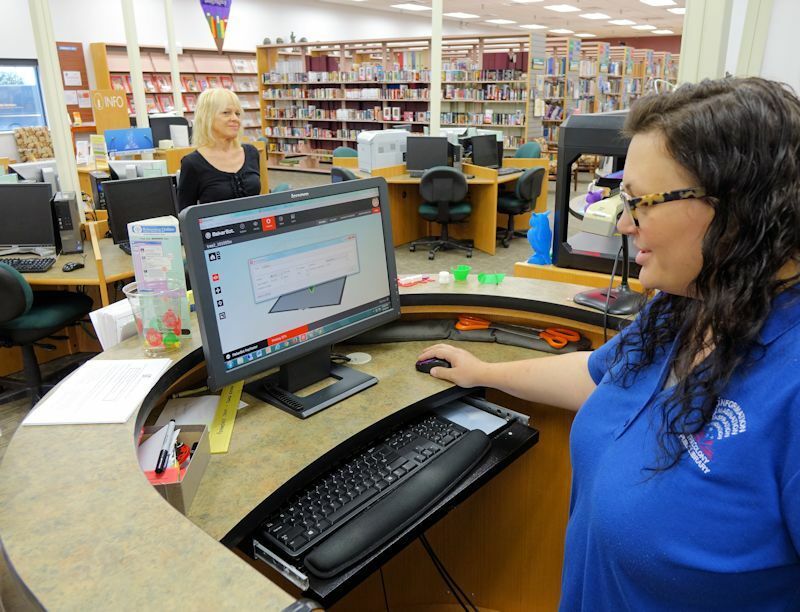 E-Services Librarian Cary Cox said the stations are designed for children in preschool to early elementary school, and support one of the library’s primary missions – promoting early literacy. All of the early literacy computers are completely new, with new hardware, accessories, and updated programs, many themed with popular children’s television characters. They are touchscreen enabled and cover all manner of subjects including art, science, reading, music, geography, math, history, and more. One of the machines also offers a bilingual interface. All have brand new headsets and stands. Technical Services Library Megan Charters said there are typically children of all ages huddled around the computers most of the day, watching their siblings play games or waiting their turns. “Educational enrichment is the goal,” added Charters. TCPL’s MakerBot 3D Printer is available for a variety of print jobs – from trinkets to practical applications. Another educational tool in the library’s arsenal is the new MakerBot 3D printer. After working through some technical hiccups in the early part of the year, the printer has been going strong since March. 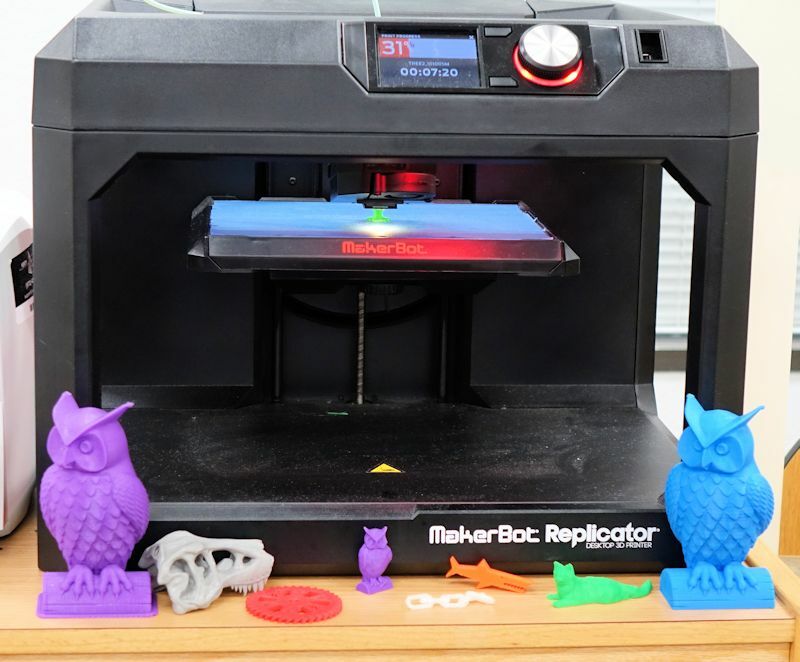 While there is certainly a novelty in seeing pre-designed trinkets go from the computer screen into one’s hand, library staff members encourage patrons to utilize free software for creating unique and personal 3D designs. The process teaches math and design principles, Charters said. Patrons wishing to use the printer must make an appointment and provide an .STL file compatible with TCPL’s printer and software, which provides a preview on the screen and various settings, including resolution depending on the detail and angles of the objects being printed. In the beginning they were getting lots of pre-made designs but Charters said more and more people are starting to bring in their own files. “It’s exciting when I get to the load file and see what they’ve come up with,” she said, adding that some files can be scaled down if needed but others can’t depending on the purpose of the object. The free software ranges from beginner (Tinkercad, 3Dtin) and intermediate (FreeCAD) to advanced (OpenSCAD, Blender). All teach math and design principles. Technical Services Librarian Megan Charters, right, demonstrates the software interface for the library’s 3D printer. Charters said most designs are more or less hollow but the more dense the object the longer it will take. Users pay 10 cents per gram of filament required for the job, with a minimum of $1. The filament is a twine of PLA colored plastic. The printer works by heating the filament to 212°C then moves back and forth building the object from the bottom up. “The filament is hard but flexible. It feeds in from the back then goes through a tube into an extruder. As it goes through the extruder, it liquefies. The tip is extremely hot,” Charters said. The MakerBot cost about $3,000 and was paid for by a donation from MarineQuest, which included enough funding for a large cache of filaments and product warranty. Funds were also used to buy a new charging stand for patrons’ mobile devices and a new color printer. The Colony Public Library recently installed a charging station for patrons’ mobile devices and a new color printer. The library’s latest technology addition is an Assistive Technology Workstation for persons with vision or motor-control disabilities. This $9,000 computer and accessories was funded by a federal grant through the Texas State Library and Archives Commission. “It has all kinds of special input devices, such as a track ball and track pad, large-print keyboard, and a zoom-text screen magnifier,” Cox said. “It is also equipped with voice recognition software, a motion-controlled cursor, an image reader for magnification on screen, and a braille terminal for both input and output,” among other features. There are a few kinks to work out still and staff members need some training time so they can properly assist patrons but they hope it will be up and running soon. 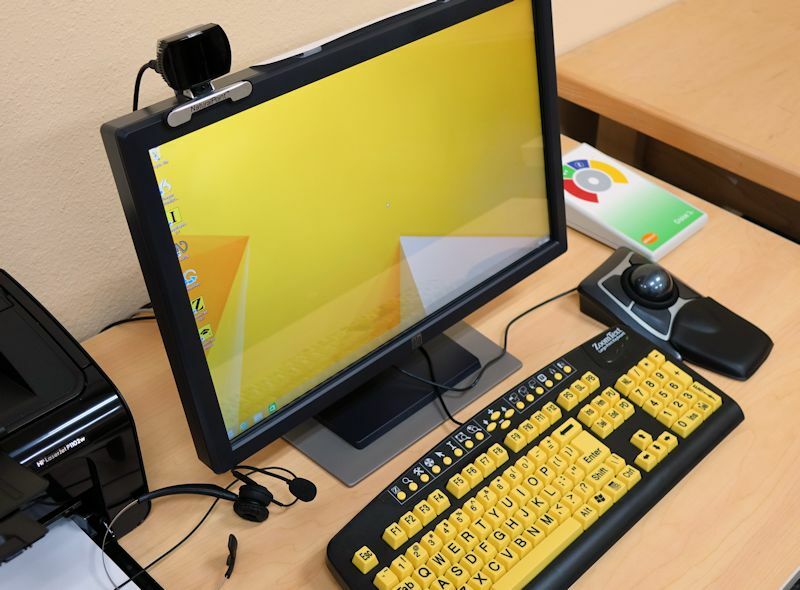 The library’s new Assistive Technology Workstation features a large-print keyboard, track ball input, and a motion-controlled cursor device. Charters said libraries routinely undertake annual assessments of services provided to determine a standard against other libraries and look for areas to focus improvements. Based on the latest assessment, TCPL staff targeted the acquisition of an assistive workstation as a step toward improving TCPL’s ability to accommodate users with disabilities. Regarding the library’s overall technology goals, from ebooks and other downloadable materials to the newest equipment installed this year, staff members are continually trying to find ways to stay ahead of the game and anticipate the needs of the community in order for their motto to be realized.